Kusatsu Onsen symbol "Yu-batake" is less than 4 minutes on foot and Otaki no yu is a 1-minute walk from the Yu-batake. 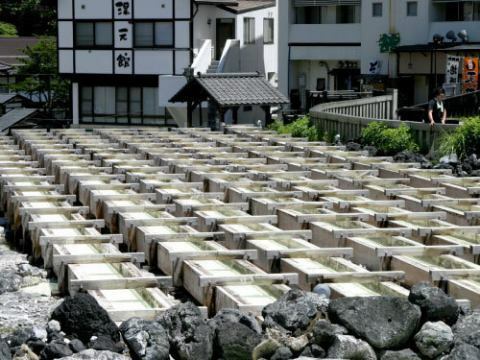 Feel free to wear a yukata crowd and take a stroll in the hot spring town while immersing in the traveling atmosphere. Real hot water.Because it is a source of good quality, please relax and enjoy relaxingly. Approximately 46 million liters of hot water per day, 230,000 pieces in drums! . One, fountain is a fresh natural spring. Pure hot water amount 32,000 liters per minute. 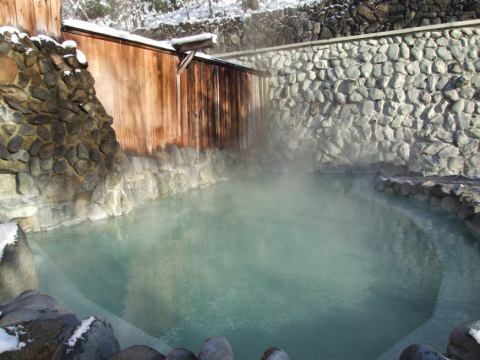 It is a hot spring boasting strong bactericidal power. Strong acidity of PH 2.08 is the strength of bactericidal power.Most bacteria and bacteria in hot water can not breed and disappear. 【Supplement】It seems that it melts and disappears when 10 yen coin is soaked for one week. Because the hot spring acid is strong, the electric appliances will break soon, the car's plating emblem will be black in about a month. 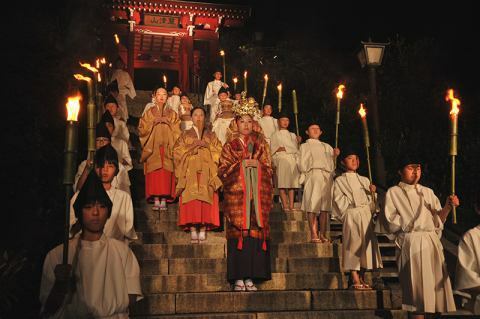 Yu-batake, Kosen-ji Temple, Candle event "Dream light"
Kusatsu Onsen the stairs of "Kosen-ji Temple" near the Yu-batake Kusatsu Onsen, a candle event is held for the date only. Yukimura rising from hot water Yu-batake plenty of hot water and cliffs of candle creates a fantastic world. When you visit Kusatsu travel with your boyfriend or couple, try wearing a yukata and go for a walk in Yu- Yu-batake night. A traditional Kusatsu Onsen specialty! The collective bathing law unique to Kusatsu transmitted from the Edo (time period) era is hot water.Yumomi for 20 minutes with a long plate of "Yumomi" and warm up the source of about 51 degrees from 47 degrees to 48 degrees without using water.At this time, it is Kusatsu tune of "Kusatsu good, this one, ~ Come came ~ Doccoisie!" To sing with all. 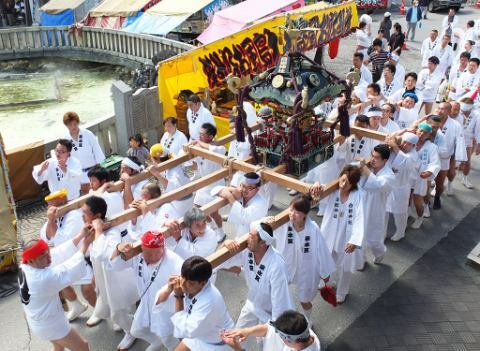 The Shirane Shrine festival of Kusatsu machi is held on July 17, July 18 every year. The whole town is filled with shrimps and it is quite lively! In the early afternoon, they are cute with children's cute mikoshi, and at night they are full of powerful adult shrine mikoshi! Mikoshi is 8? As I go out, I am exciting around the town. I think that you can enjoy the special Kusatsu Onsen which is different from usual as a store opens also in the Yu-batake. The hot spa town is most booming in a year is mainly held on Yu-batake special stage, known as "hot spring thanksgiving day" for 2 days.It is opened on the occasional morning of October, due to hot water arrival in the morning of Ox, after a story that he wished for a disease-free blow for one year afterwards, then changed to a modern age to appreciate the hot spring. "Sai no kawara Park" located in the center of Kusatsu Onsen, about a 10-minute walk from Yu-batake (Yubatake) (Saionokami park).It is located in the Joshinetsu Kogen National Park, a place that was afraid of being called "Ogre's place to live" "Demon spring water" etc. from its unique landscape. 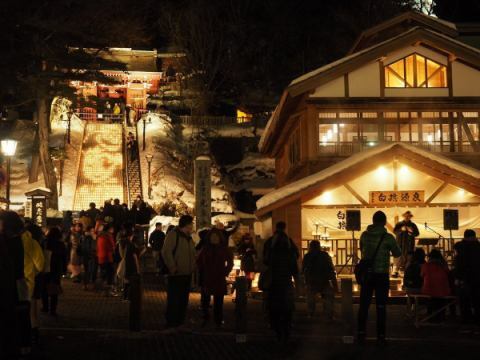 The area around Yu-batake is also the most popular spot in Kusatsu Onsen, which is crowded with lots of people in the night lighting, but if you extend your feet for a while, light up is also taking place at Sai no kawara Park in the Sai no kawara Park! 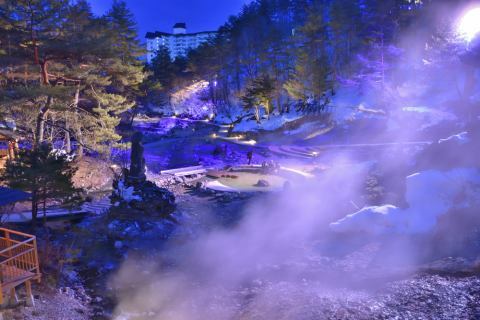 Yu-batake are few people compared with Yu-batake surroundings, yet it is a fantastic spot in the Kusatsu Onsen the evening, recommended for couples that light ups are also fantastic and can also enjoy foot baths. About 5 minutes on foot from Takamatsu Yorokobi no Yado! 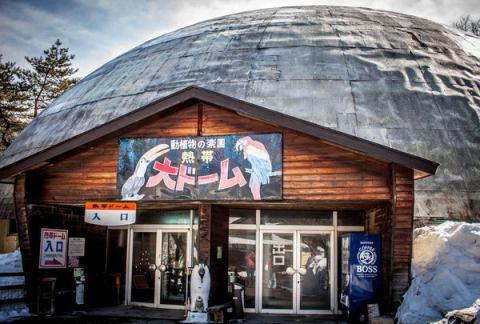 It seems to be at the highest altitude in the zoo in Japan, and it seems that the dome is being warmed using hot spring heat. Admission fee is 1,000 yen / person for adults, but if you print a discount ticket on the official website you will enter 800 yen. 700 yen for high school students, 600 yen for children below that.You can read in the tropical "garden", but the tropical "sphere" is the official name. ※There is also a discount ticket at our front desk! I will not enter after drinking. Kusatzu-no-yu is strongly irritating, people should refrain from drinking or fever. I'll put a hot water and then enter. In Kusatsu, where the hot water temperature is high, Kusatsu hot water on your head and body, let it fit your body to heat and then relax. First, 10 minutes is enough for the beginning. It is bad for a person to take a bath for a long time suddenly.Let's gradually extend time as I get used to it. First, I do not go up warm water. It is good to warm up the bath with a towel rinsed in hot springs and leave hot spring ingredients on the body. I, take a bath after bathing. When I sweat a lot, I take a lot of moisture after the bathing iron rule. 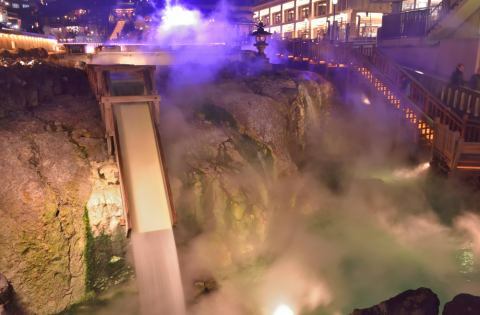 Speaking of Kusatsu Onsen springs in Gumma Prefecture, the specialty of Kusatsu Onsen is "Yumomi Show. "It is a performance that stirs hot water with a plate in accordance with the song "Kusatsu yo ~ cousin ~ once to come", but this Yumomi is not just a flashy performance.Kusatsu's source is hotter than 50 degrees, I was born considering cooling down the hot water without diluting the ingredients of the hot spring with water. 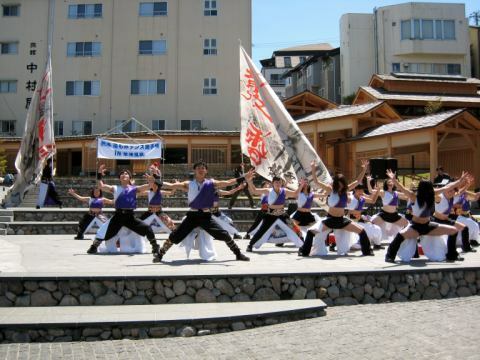 The dance battle "Hot Yumomi water Yumomi Kusatsu Onsen dance championship in Kusatsu Onsen" with such theme "Yumomi" as the theme is done! This event started last year, an event that performance of Yumomi various genres of dance such as pops, hip hop etc. 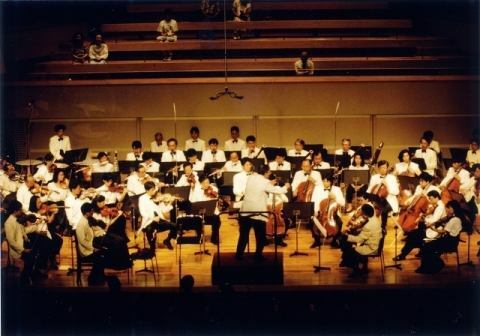 A festival (concert) will be held every day at the Kusatsu Music Forest Concert Hall, inviting first-class classical performers from all over the world and opening the Academy, and unleashly showing off their skills. 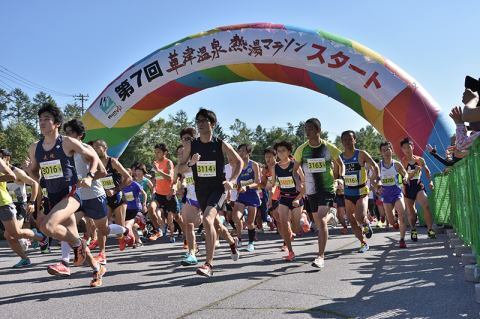 "Kusatsu Music Forest International Concert Hall"
It is only this tournament that you can run in Yu-batake, a Kusatsu Onsen spot in Kusatsu Onsen, and onsen! 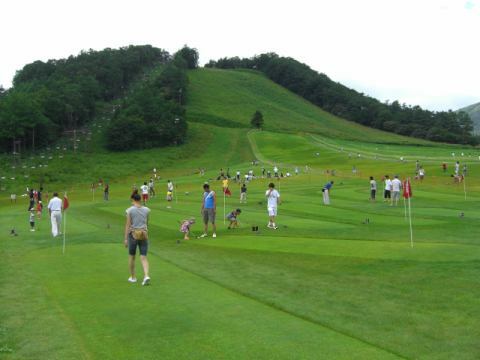 It seems that the Kusatsu Plateau altitude of 1200 meters also has a rich landscape on the course and it is a pleasure tournament! 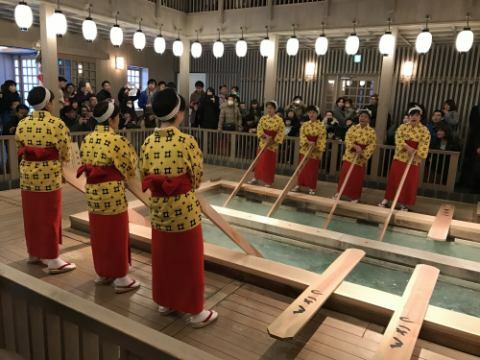 "Kusatsu Onsen free bathing ticket" as participation prize! After running and sweating, it is good to relax and relax at Kusatsu's famous hot spring! One of the most important things for marathoners is recording measurements, runner 's group is fully supported! Runner 's Chip is to measure time quickly and accurately. From long ago people at Kusatsu Onsen wished to frequently grow hot springs and grow up spiritually as children were born.Hot springs as a gift from nature, especially Kusatsu Onsen springs, have been said to be "effective for all diseases" since ancient times, healing diseases of many people.It will be annihilated. Neuralgia · Muscle pain joint pain · frozen shoulder · motion paralysis · stiffening of joints · crying · whippers · chronic gastrointestinal diseases · hemorrhoids · coldness · recovery period after illness · fatigue recovery · health promotion · chronic skin diseases · chronic gynecological diseases · galling · Diabetes · Hypertension · Arteriosclerosis · Acne · Wakka etc. 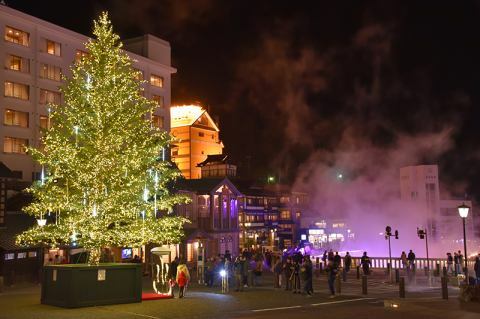 This Christmas tree was installed for the first time in the Yu-batake of Kusatsu Onsen to make it enjoyable for tourists, the height is about 10 meters, about 20,000 bulbs and about 300 decorations are attached. A lighting ceremony took place from 5 pm on the 16th and a big cheer cheered from the tourists who surrounded the Christmas tree when the lights were taken. A girls college student who visited from Kanagawa prefecture said "It is very beautiful and very satisfied with the light up of the Yu-batake. 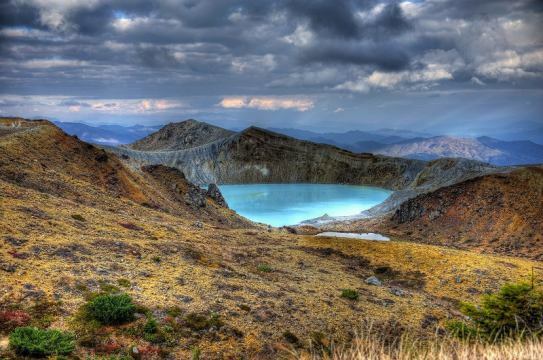 I think that Kusatsu is a tourist spot that can be recommended for the younger generation. " The green season is full of charm as well! 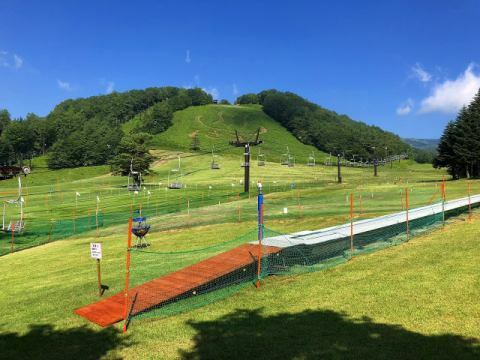 Mt Tengu ski run, you can also enjoy glass skiing and mountain boards, mountain carts that are popular with children, and new items "Sky Trampoline" that can enjoy a big jump up to 8 meters above the ground and "Nine Bots" of NEW item standing robots! Also the dog run is also permanent, so you can use it with your dog. "Kids Park" opened in the Tengu mountain play zone! Items in Kids Park are the following lineup. Move easily with moving walkways, please enjoy Strider and Bokkaru. This season, a new course"R292" is born. There are plenty of events that can be enjoyed from children to adults. 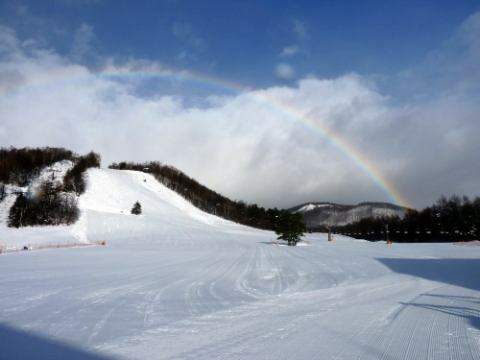 You can enjoy Susuma's powder snow and famous hot spring Kusatsu Onsen.